I have done the emptying with a simple Bunnings tub and I can tell you, it's back breaking work, especially if you have lots of mulm which makes it almost impossible to get all shrimp out. I am guessing I got about 70% out but can't be sure. Square net is a must as agrubs pointed out. Otherwise fish are so difficult to catch. Especially the last one. But I usually lower the water level right down before I catch them. Lower to 95% and they can't run too much. I have a big 30cm square net so that will be helpful. Any tips for acclimatising the fish to indoor life? I am going to shut down my CPD tub tonight. On the weekend I half filled their new fancy garage tank with tub water and one of the sponge filters. Is it as simple as filling with the rest of their tub water and chuck them in? They already seem to eat anything I throw in the tub, but I guess they will miss their live food from being outside. Garage tank sounds almost too fancy! Yeah just transfer them over as you planned. Haha - custom search terms FTW! Grubs, I'll go you halves... Volume discount?? 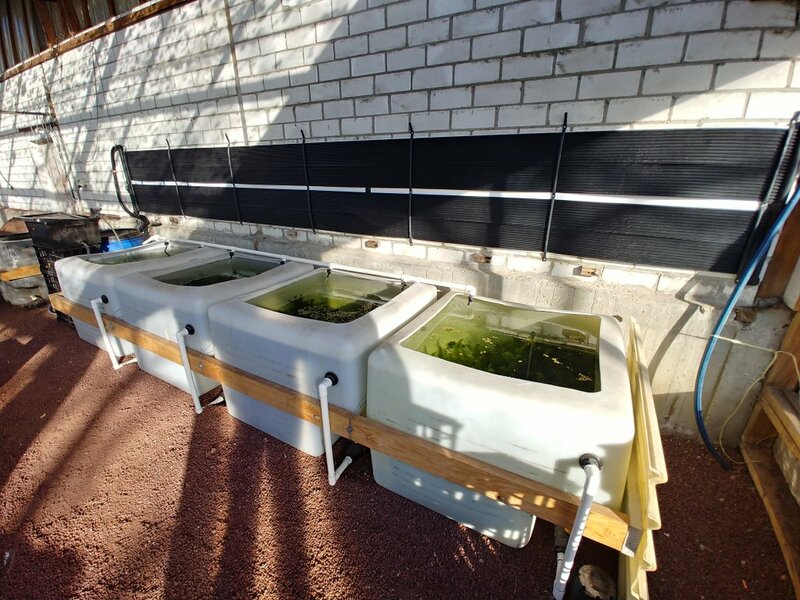 Lost some fish and plants to the cold so installed solar heating. This is all in my glasshouse but the 1000l tubs were 12C this morning and have been as low as 9C - a glasshouse is a cold house if the sun doesnt shine! Solar panels/matting - surprised by the good quality given the price on ebay (I paid $100) - 0.75m x 6m area. Held against the north-facing wall using lengths of 13mm irrigation polly screwed into rawl plugs with thin scraps of polystyrene behind to keep the solar tubes off the cold bricks. They might work a lot better on a flat roof but it would take a big expensive pump to get the water on the roof and then might be too cold so the wall seemed a good out-of-the-way option. 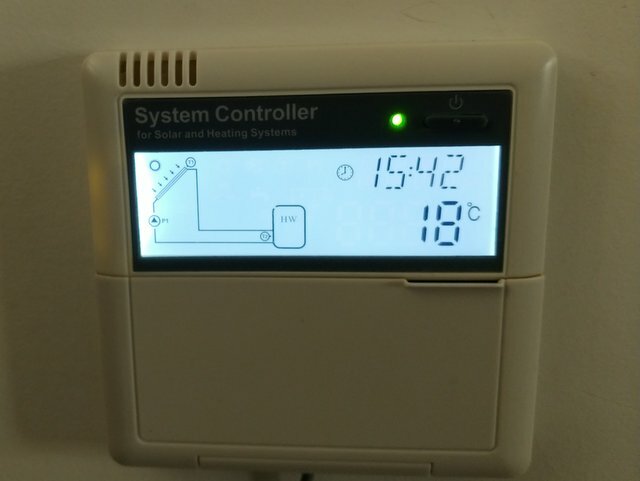 Solar Controller model SR868C8 - same one I use on my fishroom used for 2 reasons (1) no learning curve to setup and I know its reliable and (2) has the added feature of a reverse cooling in summer - ie if the tubs get hotter than the set temp and the pannels are cooler (e.g. at night) the controller will turn the pump on to cool the tubs down. Only two of the tubs have fish at the moment - a small number of honey blue-eyes (Psudomugil mellis) in one and some River Murray Rainbowfish (Goulburn River) in another - I had a small number of gertrudae and furcatus and a bunch of Caridina wilkinsi in the other two tubs but they got too cold and perished. 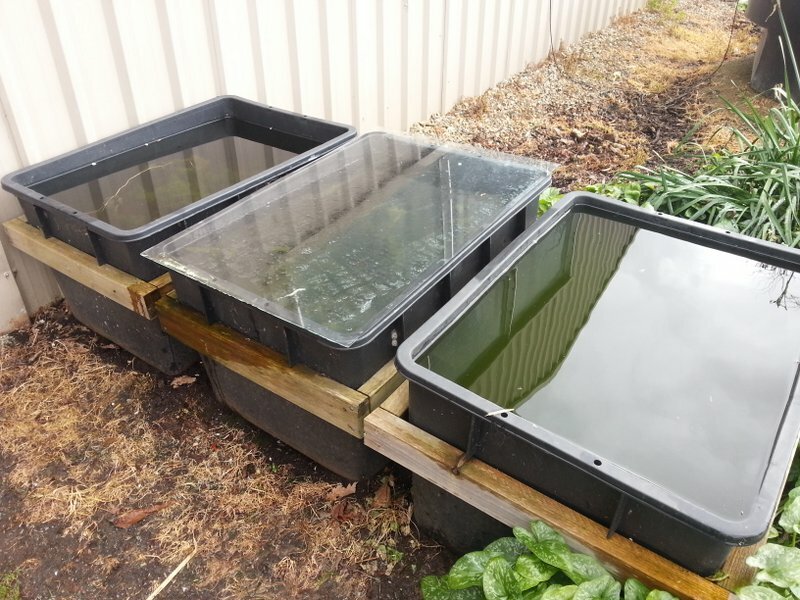 I'm not aiming to keep the water warm enough for tropical fish all year 'round as I don't think thats possible but the solar will extend the "summer season" by a couple of months either side of the cold dead heart of Melbourne's winter and hopefully the warmer average temp - even if only 15C will allow some plant to keep growing. The only plant that has done well in the cold is Hornwort.... lots of hornwort! (Ceratophyllum demersum). Last edited by Grubs; 10-08-18 at 02:57 PM. Solar hydronic heating! You are living the dream Grubs! Nice build indeed. Is the fishroom also warming the green house via that duct that you designed? No. The glasshouse heats the fishroom but only when the temp in the glasshouse is high enough which happens only rarely over winter. The weekend forecast is terrible 6-12C tomorrow and 3-13C on Sunday so the tubs are going to cool right down... dammit! I wonder though, for $600 outlay, whether you could have just individually insulated the tubs and chucked a heater in them? Other considerations include getting the tubs insulated from the ground say with a 50mm XPS and perhaps wrapping the tubs up. For the summer you can use XPS lids. I am considering this technique if I get my green house ideas off the ground. Even two layers of bubble wrap will give you pretty good insulation properties. You could convert your glass house into a solar passive design but it will cost $$$. This solar gear set me back $300 (after ebay discounts) but was paid for from fish I sold and the running costs are almost nothing - Despite my grumbles I'm happy if it adds a couple of months either side of summer. I have toyed with insulated foam boxes and bubble wrap on a smaller scale for my crypts and the heating costs are still pretty high. 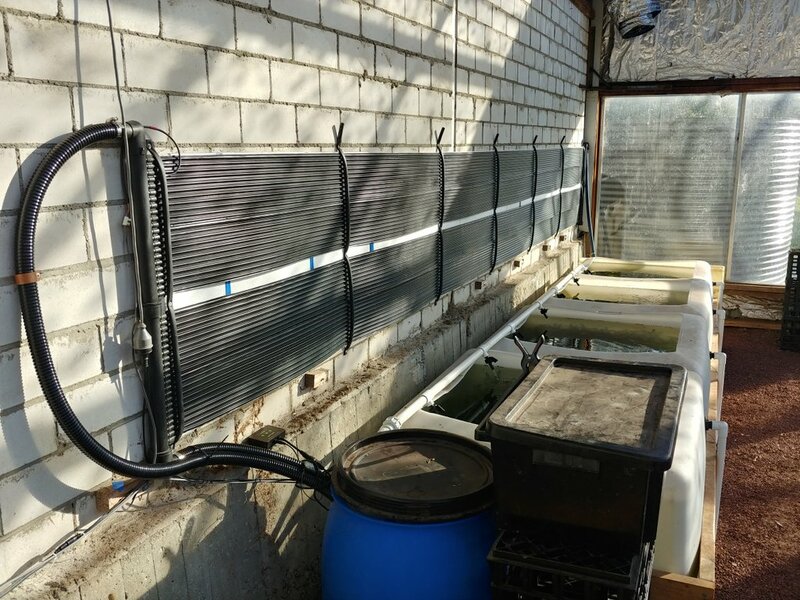 I am on the scrounge for some coolroom panels to insulate the big crypt tub - currently 300W of heaters that cant keep up burning up the $ (cheaper than losing the plants though). Speaking of outdoor tubs - it was so windy the other day it blew the glass off this tub and smashed it all over the gravel driveway - so now I'm on the scrounge for some cheap polycarbonate roofing offcuts - far safer! Last edited by Grubs; 11-08-18 at 11:27 AM. Ah you were smart to get the ebay discounts!! Once needs to compare the operating costs of an insulated system (electricity) vs the solar system. You'd generate more revenue if you were running all year around so the calculations would be a little more complex. Grubs that's such an awesome setup!! I'm hugely jealous. How have your temps been the last couple of weeks? On another temperature related note - I left one of my tubs set up over winter and I still have red cherry shrimp and danio erythromicron fry alive and kicking. 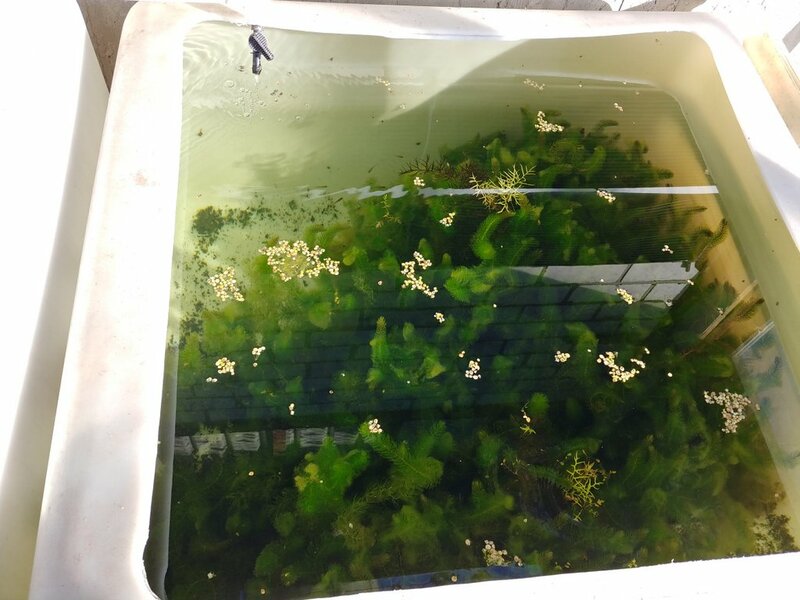 I checked the temp this morning and in the open section of the tub it's 14 deg C, however under the thick mat of Amazon frogbit it was 18deg C! It felt warm to the touch too. I assume the thick mat of plants is providing and insulating layer to the top - perhaps this is why everything has survived the winter?